Her first impression: The supernatural world was surprisingly similar to reality. She opened her eyes and looked around. Lifting her hand in disbelief, she slowly flexed each intricate finger muscle. She gingerly touched her nose and ran her hand through her hair. “Are you an angel?” she asked. This 80-year-old lady had recently been diagnosed with metastatic lung cancer. Overwhelmed with the impending experience of vitality slipping away, she took all the pills in her cabinet and slowly felt herself melt into what she thought was death. I watched as she remembered. After a few minutes, a thought crept into her mind and a pained grimace spread across her face. Tenderly, she whispered her daughter’s name. “I’m so sorry,” she said, desperately addressing the space in front of her as if clinging to some hope that her daughter could hear. She had seen death as a welcome escape, but the memory of a loved one left behind planted itself in the pit of her stomach and refused to leave. I watched as emotion overtook her mind. She began repeating her daughter’s name, clinging to the letters on her tongue as if they were the last way to feel her daughter’s presence. Her eye began to glisten and one single tear slipped out. It ran down her cheek and along the contour of her chin. She paused. Slowly, she reached up and touched her face. She studied her finger. “Dead people don’t cry,” she said, in a soft and confused voice. She looked around the room again, this time contemplating a seeming impossible idea. Mystified by the situation, I was unable to respond. I simply watched her come to the discovery of herself. Heavy-eyed nurses and doctors turned from their work and came to watch. We stood around her bed, paralyzed by the simple joy of life rediscovered. This woman had been offered a new beginning. 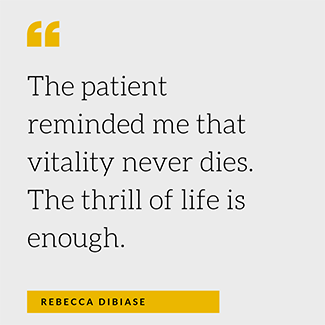 The patient reminded me that vitality never dies. The thrill of life is enough. The pure and simple drop of a tear was the strongest reminder of life’s beauty. Even in the midst of a slow death evoked by an unrelenting cancer, she was overcome with a love of life so strong that all she could do was yell until she no longer had a voice left. I found myself wishing I could invite anybody who had ever doubted the beauty of life to witness this powerful moment. When I started medical school, the anticipation of these moving encounters frightened me. I was unsure how to prepare myself for them. How should I help patients through such meaningful times when I had trouble comprehending them myself? A year later, I was leaving the same hospital after a long day at work. The heat of July descended on me, and I could feel the moisture in the air settle on my skin as I began the concrete walk to the parking lot. I had worked many hours that week, and was unable to focus on anything except the image of my bed and a bowl of cereal awaiting me at home. As I rounded a turn in the sidewalk, a vision struck me and stopped my footsteps. I stood paralyzed in awe, staring at a sunset so brilliant that it looked to be a slice from heaven. A majestic vision of red, orange and gold spanned the entire sky, casting a yellow light over the evening. When life becomes busy, it is often easy to let exhaustion turn to numbness. We crawl into a world without feelings or emotions because it is easy to survive the day that way. The world feels small, and each moment is merely a piece among a large list of tasks and hurdles. However, eventually we begin to miss the power of life, the feeling of pure laughter and even the refreshing release of tears. It is at these times that we can truly learn from our patients. The beauty of medicine is the window it opens into the most powerful moments of the human experience. One Comment on "I’m Alive!" What a beautiful post. Thank you for sharing such a poignant moment with your readers!